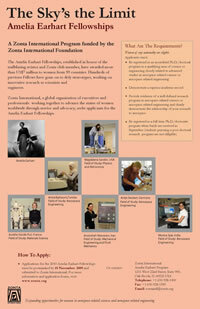 The Zonta International Amelia Earhart Fellowships are awarded annually to women pursuing a Ph.D./doctoral degree in aerospace-related sciences and aerospace-related engineering. The Fellowship of US$10,000 may be used at any university or college offering accredited post-graduate courses and degrees. Students must be registered in a full-time Ph.D./doctoral program when funds are received. The closing date for 2010 is 15th of November 2009.